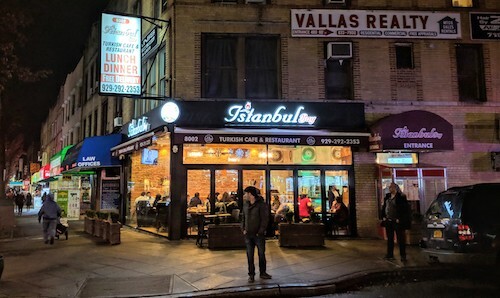 On a chilly Friday night two and a half years into its life, Istanbul Bay was buzzing as hungry patrons waited for a large group to leave so they could all get tables in the relatively small restaurant. 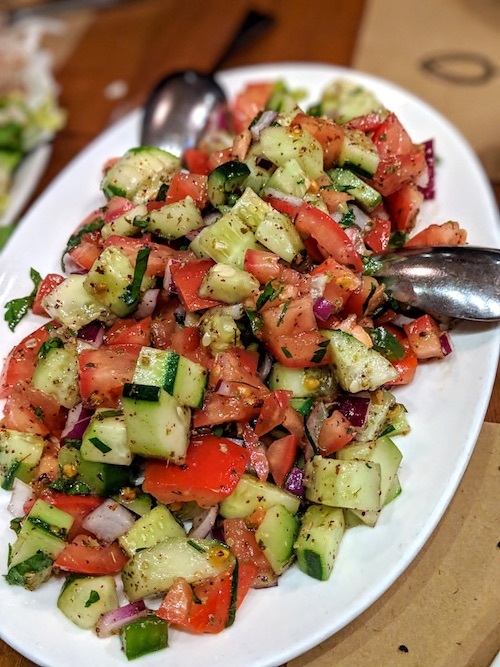 This location is the younger sister of the group that also runs the 16 year old restaurant on 86th Street in Gravesend that now has the same name. This good reputation seems to have come with them as I have rarely seen the restaurant empty since opening. 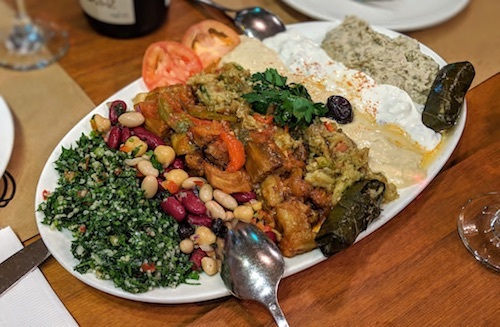 The menu is not unlike that of the other spot and many Turkish restaurants in Brooklyn, and has platters to make sampling many items in one order possible like the mixed appetizers ($17.95 large, above), a plate of eight items. A large puffy piece of bread fresh from their oven (see end of article) will have already arrived at the table ready to be torn apart and dipped into each. 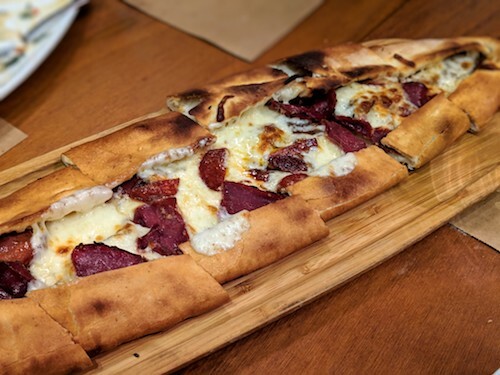 Besides the bread, the oven is constantly churning out their very good pide, like the karisik pide (above), a combination of Turkish sausage (sucuk), lamb gyro, pastrami and mozzarella. 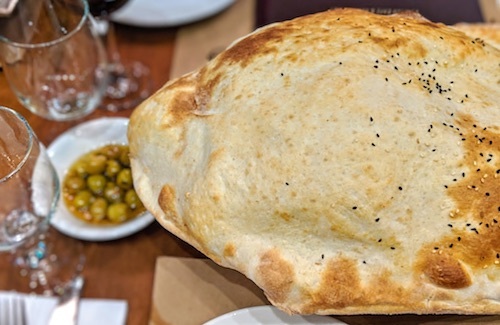 Sometimes you will find pide translated to "Turkish pizza," and to be honest it makes you wonder why Domino's is in business when things like this are available. You will have probably noticed the two beautiful spits of gyro meat when you enter, both of which seem even better here than at the original restaurant. 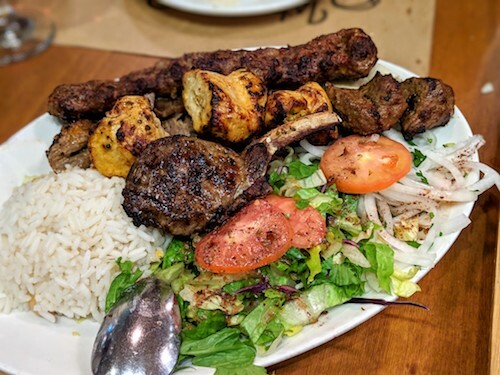 Like the cold appetizer meze, the mixed grill ($23.95) is a great way to unlock a good portion of the meats menu for sampling. The lamb gyro is underneath the rest here and unseen, but even without it the other cuts speak for themselves. The wonderful complimentary dessert was a very nice finishing touch. 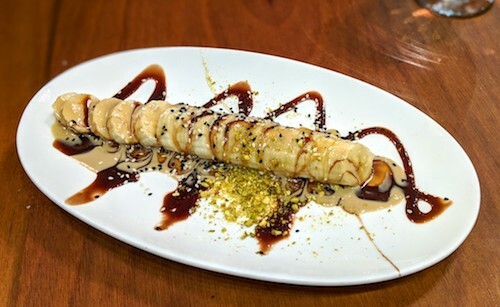 This banana below was covered in a nutty sauce, crumbled pistachio, and both white and black sesame seeds before a drizzle of chocolate. Even though our table was thoroughly stuffed, this was no issue and disappeared immediately. Fresh bread straight from the over to your table.